Having written on the land sighting experience of the Spicers some weeks before, I made one of my usual trips to the loch with some ideas in my mind, but one was certainly at the forefront and that was to find the location of the creature the couple saw over 84 years ago. We continued on our way. We met a roadman. When I told him I had just seen the monster, he was astounded - not frightened, just incredulous. After the Spicers had driven on, Mr. McCulloch cycled to the spot where they had told him the animal had crossed and added his previously unpublished confirmation that the undergrowth was flattened, both above the road and below it down to the lochside. "It was as if a steamroller had been through", he said. Presumably, this information came to light in the 1960s when the LNIB and other monster hunters descended on the loch and began to question locals about events past and present. This provides corroboration for the Spicers testimony. Cynical diehard sceptics will merely sneer that William McCulloch was lying. I asked one lifelong resident of Foyers on my visit whether he had heard of William McCulloch and he confirmed he knew him as an older man when he was a lad and that he worked at the Aluminium Works which is now long closed and whose buildings are used by the energy company, SSE. So much for that, but it is a pity that Mr. McCulloch's interviewer did not ask to be directed to the exact spot as it remains a bit of a mystery to this day. The map below shows two proposed locations. 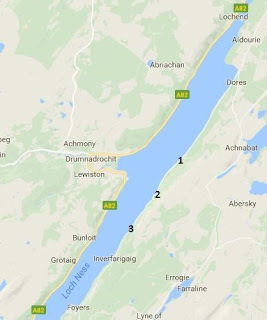 The first location is the one marked on a map of sightings found in Rupert T. Gould's 1934 book, "The Loch Ness Monster and Others". Since Gould interviewed the Spicers only a matter of months after the event, you may conclude that he was best placed to ascertain the location. Unfortunately, he admits himself that even with the help of local knowledge, he could not find the location with any degree of precision. This is probably no surprise since the Spicers would have been completely unfamiliar with that road, and having driven up and down it myself many a time, there are long stretches of the road which are devoid of landmarks or any other signs which would allow provide a frame of reference. Nevertheless, Gould places the location where he does without much of an explanation why. Most other accounts (such as Witchell's aforementioned book) simply follow what Spicer said in his own testimony which states the event happened about midway between the villages of Foyers and Dores. That is marked as the second location on the above map. However, one feels that this is a generalisation as Gould decided to place it a bit further north for reasons unknown. With these in mind, I decided to take a fresh approach and use three markers mentioned in the various accounts by George Spicer. The first was that the creature was seen crossing the road about 200 yards ahead of them. So, the first marker would be a stretch of road which has a clear view ahead for about 200 metres. The second was the statement from Gould's book that "the car was climbing a slight rise" when the creature appeared. This one is a bit more difficult to interpret as it it does not imply that the overall stretch of road was rising. So there is a bit of latitude in how one interprets the overall topology of the 200 metre stretch. The third parameter is drawn from George Spicer's letter to a young Ted Holiday in 1936 in which he says the loch "was only twenty foot down on the right". The challenge was to find a stretch of road which fulfilled all three of these requirements. So starting from Gould's location, I walked for three miles, stopping when a stretch of 200 yards or more opened up. If the stretch of road generally descended, I ignored it and walked on. Since the road tended to be a series of undulations, you would encounter a rising road after a descending road, though many had bends in them which turned before the 200 yard condition was fulfilled. When one of the rising sections of road qualified, I would identify where the crest of the road was and walk to that point. At that point, the third parameter kicked in and I would estimate how far the loch was from the roadside. After walking to the halfway point between Dores and Foyers (location 2), it became apparent that the first two parameters had enough on the ground solutions, but the loch was always too far from the road. So I then got in the car and proceeded towards Foyers, stopping at any point of interest. The distance between the loch and the road does narrow significantly until you reach a low built wall just outside Inverfarigaig which is only a few feet from the loch's breaking waves. It became apparent that if one held to the "twenty foot to the loch" rule, then this area had to be where it all happened. There were one or two spots that fitted the bill and one I favoured was a partly rising stretch of road just beyond the aforementioned wall. This would be beyond the halfway point between Dores and Foyers and closer to Foyers, perhaps about four miles and is marked as location 3 on the final map below. It has the loch close beside and it has some kind of forest to the left, unlike some areas which are a rising wall of stone. The problem for me was interpreting the phrase "the car was climbing a slight rise" as 200 yards and "slight" do not equate for me, suggesting the "rise" could have been all but driven over as the creature came into view further away and that to me means that the remaining road ahead could be actually descending and open up further potential sites. Furthermore, the road has changed since the 1930s when it was relaid and that may have some effect on the topology one is trying to examine. However, I am pretty sure that the creature the Spicers encountered that day was on this general stretch which I would initially estimate to take in a mile of road. That's good research. I'm familiar with that low-built wall and agree that the stretch you found is a good candidate. Do we know how thickly wooded the land uphill from the road was in Spicer's time? There might be some old postcards showing the forest, but it looks like it couldn't be any thicker to me. Fantastic article, thank you Roland. If only trail cams had been stationed along this stretch since they were invented. I can't imagine how many times one or more of these animals has crossed the road at this stretch over the last 80 years. Trail cams along that stretch for the last 20 years would almost certainly have bagged clear footage of the creatures. I have toyed with that idea before but the main issue is visibility. It is pretty hard to hide a camera pointing at the road from walkers, drivers and cyclists. There is also the issue of cars which would all trigger the camera and drain the battery. So over six months, one may take thousands of pictures of cars and drain the battery or fill up the SD card! Finally, trap cameras have a 60 foot range, so over the 11 mile stretch between dores and foyers, one would theoretically need 1,000 cameras! But in practise, the number would be far less as many points along the road are too far from the loch or are barriered. The other solution to the car trigger issue is to set the camera to only operate during certain quieter hours - a feature on some cameras. Good points, hadn't considered all the false triggers from cars. There must've been literally dozens of drivers over the years who caught glimpses of these animals but were too nervous or shocked to report what they saw. We know they generally stick to nighttime for their land excursions. I can't imagine how startling it would be to see a 30 foot long prehistoric creature crossing the road in front of me! You've got to feel some sympathy for the numerous people who no doubt have been subjected to such a terrifying spectacle. Thirteen claimed land sightings after the 1933-34 spike. That is one every six years. One report for every 6 years yes, but I'm certain the number of sightings is far higher. GB, how steep is the incline on the wooded side of the road (the side across the road from the loch? It is quite steep, I have climbed up it and it can require some effort. But it does vary somewhat. One may presume that an LNM only comes ashore if there is a clear gentle run up an opposite hill, but I don't think that is a prerequisite. I'm thinking that an area with a gentle slope on both sides of the road would help pinpoint the location. It seems highly unlikely to me that an animal described as being a bit awkward when moving on land would be able to successfully traverse a steep slope. Yes, I don't think such a creature would range far on land. the quest for the exact location is interesting but what insight will it give, are the locations of the 13 sightings random or concentrated on the east shore ? I feel better for that, GB, is there a list of the 13 land sightings in the blog somewhere ? click on the sightings table halfway down, right click "view image" on firefox to enlarge. I can vouch for how difficult it is to re-find an exact location around the loch. I tried to find an area where i had camped with a friend during a visit only 15 years previous & it took me ages & i wasn't even then 100% sure , so finding the exact location (or close to it) of the spicer incident over 80 years later would seen nearly impossible. John, I wouldn't get too vexed about the north/south v east/west nomenclature. We all understand which is the north/west shore and which is the south/east shore. I wonder, has there been any study into a possible correlation between locations of land sightings and the flora/fauna at those spots at the time of the sightings? I'm thinking that the animals might choose their locations for land excursions based on either (a) randomness, whereby they emerge simply where the terrain allows them to, or (b) where there is adequate tree and shrub cover and/or the sounds of sheep nearby as a potential food source. It could be that the animals are omnivorous, and the undergrowth represents nutrition as well as cover. If the animals are pure carnivores, then regular sounds of sheep and deer in particular locations would make them ideal for an emerging Nessie to take food and return quickly to the depths of the loch. I personally believe they go onto land more than the reports suggest. I think deer are captured and consumed at times when the loch's salmon population runs low. The salmon population at Loch Ness is seasonal, in the same way it is elsewhere in natural river systems with inter-connected lakes. One thing we can be entirely certain of from the sightings database is that these mysterious animals do make trips onto land, and they do appear to return to the water with the prize of a high-protein meal. Sheep and deer are not that common along this road. If the animals use them as a significant food source, they must spend a lot of time close inshore listening (or sniffing) for them. There are laybys close by. Surely we would expect more sightings? I think Nessie chasing deer up hills is a sceptial straw man. My own view is they come ashore at night before dawn to grab any deer coming down. Even then, it appears these are very rare events. Roland, I agree entirely. I was not suggesting a chase, more of a nocturnal stealth attack. I'm sure deer and sheep could outrun the Loch Ness animals, so it would be essential to spring a surprise attack from close range. Yup, pretty much like orcas and catfish spring surprise attacks. Hopkarma, its verified fact that the animals occasionally go onto land. It has been witnessed on many occasions. It's also a matter of record that the animals have carried smaller animals back to the loch. The animals clearly don't breed on land. So the only other logical reason for their occasional forays is to satisfy the need for food. I was only speculating about sounds of sheep and deer, but I do regard the hypothesis as possible. A deer could be snatched from the water's edge as it drinks. This could lead the LNMs to look further afield for this source of nutrition. Who knows, most trips on land could be fruitless for the very reason you mention, that the animals are too slow to catch deer and sheep unless those prey are caught unawares at close range. I don't discard eyewitness testimony relating to land sightings, it's simply too strong to be brushed aside. It's not a 'verified fact'. There are some eye witnesses to it and as we all know eye witnesses comprise the least reliable form of evidence. It's fine to speculate but talking about verified facts is jumping the gun a little prematurely. Eyewitness testimony is accepted in a court of law, and has convicted many a person 'beyond reasonable doubt'. My opinion is that these sightings are as much verified fact as courtroom eyewitness testimony. If others disagree so be it. That's why court juries consist of several people. Anything about these "animals" is pure conjecture and nothing about them can be called verified fact!We need to back up a bit and prove their existence as fact before wondering if now and again they go walkabout over the Scottish Highlands! Regarding "verified facts". Yes, eyewitness testimony would be allowed in court but such witnesses would be cross examined by lawyers to expose and defects in their testimony. So, in our "court" you would have sceptics playing the prosecuting lawyers and people like myself, defence lawyers of a sort. There is a wide spectrum on the belief-disbelief scale. There are those who accept any claimed sighting as gospel and those at the other end who accept nothing no matter how experienced the witness or how ideal the observational conditions and range was. Be careful not to find yourself at either end. Kyle and Steve, for me the animals are 100% verified as existing. What isn't verified is exactly what they look like, their respiratory system, their diet etc. But has the existence of an unusual life form in Loch Ness been verified? For me the answer is a categorical YES. I should imagine if some people saw a huge creature on the road they wouldnt report it for fear of ridicule. So perhaps there are more land sightings than we think. That could be applied to any sighting. Why would seeing one on the road be any more embarrassing that seeing one in the water? with dash cams on lots of cars these days we have a better chance than ever for bagging a spicer-like land sighting. what a news day that would be. I googled and got one figure of 17% of cars have dashcams mainly for insurance claims. How many are actually installed and recording along the Dores-Foyers road is a matter of speculation. With land sightings we have to broach the hoary old problem that if the creatures are air breathers we should see a lot more of the blighters on the surface, not necessarily doing cartwheels or arched leaps, just blow hole snorts or a snout just breaking the surface. One doesn't need to scan the Cromarty Firth for decades to see a dolphin or spend years afloat off Dingle Bay in a to see whales doing whale-like things. They are there for all to see , all the time. With the loch only being a mile wide, it should be relatively easy to spot such surface activity, especially on mill pond days [ of which there are a few in an average year ] but such reports are rare when they should be ten-a-penny. Ah well, I don't think they are air-breathers. John, there are sightings in the record of small, vertical objects attached to a rounded object (one at each end of the rounded object). Professor Roy Mackal witnessed just such an object, and while he didn't think much of it at the time of the sighting, in later years he reflected that the rounded object could've been the top of a head with the 2 vertical objects possible breathing tubes. If Loch Ness harbors at most only a few Nessies at a given time, then such clandestine breathing activities could conceivably go unnoticed. I don't think they have to be air breathers to be able to go onto land. Look at the lives of freshwater eels for example. They can live at the bottom of lakes for months but can also make their way across land. This 'issue' of LNMs being water breathers but also being able to spend some time on land is a complete non-issue John. So we are in agreement that the common freshwater eel provides a blueprint for a creature which is able to live fully submerged for years but also able to breathe on land. Eels are plentiful in LN. I'm not saying the verified mystery animals are huge eels, but we at least have a large hurdle behind us now. The respiratory system of the LNM animals could simply be the same as that found in eels. Unless of course they are air breathers and have adapted a way of breathing through their skin. Maybe we're trying to assign too many attributes to one animal? I don't know. But I genuinely think that there are far too many descriptions of unusual animals for it to be one creature. indeed, it's the hump and neck thing, many sightings of humps, many sightings of head and neck, very few sightings of a head/neck/hump combo. i think the Gray photo shows a neck [ or a tail ? ] and a body. But there are head-neck/hump sightings in the record, and given the details, some of those sightings cannot be dismissed as driftwood, seals, otters, swimming deer or waterfowl. During my research a few years ago, I noted that of the 251 sighting reports Roy Mackal assembled into the spreadsheet for his first book (the best of the thousand or more of the most reliable sounding cases he collected) not ONE case of a hump and the neck-like object being observed simultaneously occurred. It's always been one or the other. And it's not that both haven't occurred during the same sighting - they have. But in every case it was reported where both a hump and neck-like object was reported the one part always submerged before the other part surfaced - they were never above water at the same time. Only an infinitesimal number of sightings in the subsequent decades contradict this, few enough to suggest they might have been mistaken observations rather than exceptions to what seems to be a very strong rule. That it's extremely difficult if not impossible for both parts to be above water at the same time surely must tell us something about the anatomy of our subject. Only in the Gray photo, where the object is caught almost completely above water, do we see both a humped dorsal region and a tail above water at the same time. That tail appears to be made to only flex laterally, so you wouldn't ever expect to see it held up above water unless the rest of the animal were in deep enough water and floating head down. Very interesting information, thank you Steve Plambeck. This thing you've picked up on in the sightings database not only brings us closer to understanding the full shapes of the animals, it also strengthens the validity of the reports. If such a constant fact presents itself over multiple unrelated eyewitness sightings, it validates those reports. Otherwise a randomness would have emerged with necks and humps being reported at the same time. The great Jenny Randles once coined the term 'fhe pink frog factor' in relation to alien abductions and UFO sightings. I think it applies here too. Interesting reading here, I like learning more on this LNM topic on this blog Roland, good stuff. Your sleuthing and investigations may lead to new sightings, undiscovered evidence, and new information. I'm glad to see a serious researcher is out there in the field and on the water. Thats a great write up from Steve, but we cant ignore the sightings of humps and necks at the same time, and there has bn a few over the years. Greta Finlays son's drawing of the beast they saw in the shallows certainly has head and humps. Looks like I jumped the gun on believing what Steve Plambeck posted. The two fisherman who claimed a head-neck sighting at close quarters in 1963 also said they saw a small hump. In 1978 a guy fishing from the shore saw an upturned boat shape surface, then a long neck emerged. Steve: Mackal's book includes Alex Campbell's controversial sighting - which was a head-neck and two humps. Edna Mcinnes and her boyfriend saw a head and neck and a hump in 1994 on the South Shore. This sighting was also seen by 3 other people, once at long range and again at close range. I saw the trailer for BBC's "Blue Planet II" which showed a fish leaping out of the water to grab a bird flying past. Just shows you how you shouldn't write off aquatic creature getting their land (or air) prey.